...your own or someone else's! Yes, tomorrow is International Edible Book Day. I am not making this up. IEBD is the creation of Judith A. Hoffberg and Béatrice Coron (a favorite paper and book artist of mine). Look here or here if you want to know more. I carved something I've been wanting/needing for a while: a fancy corner stamp. It turned out to be best to do it in two parts, that way I could cut the first side freehand and then stamp it on the rubber to get the other half. Does that make sense? The two halves can be stamped next to each other too, to get an interesting decorative element. Does that make sense? Well, the picture may help. Then I did a simple border that looks like little smiling Shmoos. My favorite thing to carve is heads/faces so I had to do another (shown here with some colored pencil embellishment), and then I carved up a few of the scraps that were left. Those turned out to be almost the best...they go together in all sorts of surprising ways. Typical. All in all a good evening, although the less said about the little bird, the better. The rubber we used is called Safety-Kut ( yeah, I know, dumb name) and it's available online from the manufacturer. It's heavy stuff and the shipping really drives the price up, so if you can find it retail in your area you're better off getting it that way. In Seattle it's cheapest at the University Bookstore, but Daniel Smith has a better selection of sizes that I like, so I usually go there. We arrived late last night, and spent today (Thursday) getting back into the swing of things, and napping, and calling people. It's been quite a month and a half. We thank for your emails and words of encouragement during this stressful and sad time. It feels good, if a little strange, to be back, and I am looking forward to Third Friday tomorrow - I need a project. I've missed my studio and my friends. 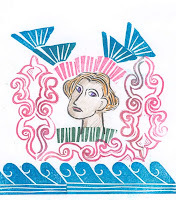 Laurie mentioned rubber stamp carving, inspired by Art Crusade #18. Yes, yes...I love carving stamps, and what a great idea for a Friday evening! I went down to Dan Smith today and picked up a big slab of rubber and some extra Speedball #1 blades, so anyone who comes tomorrow and wants to can carve stamps. It really is easy - well, you can make it as difficult as you want to but it isn't necessary. Simple is wonderful - and easy. Even if you aren't interested in carving go visit Laurie's blog. It's full of beautiful things to look at and read. (That IS a very cool red purse!) 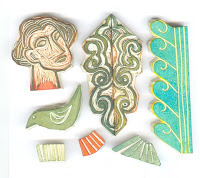 And if you are interested in carving stamps, then check out Art Crusade #18. You may want to participate. That's all for now... see you soon. I need to tall you about The Wedding and about Reading Frenzy and about the Best Coffee I've Ever Tasted. And I have a few words of advice for everyone who wants to listen. Now, if that isn't enough to get you to come back, I don't know what is!